Words went round that I was coming to Bombay. E-mails started pouring in like landslides in Nilgiri Hills. Suddenly I found myself in touch with the batch of 1964 all of them in their 50s and 60s. They were happy to spot me in Bombay. Usha (Hegde) Banerji e-mailed me a photograph of the 1964 batch taken in 2010 lest I keep imagining them as teen age youths of student days. That photograph helped me to thaw the frozen images of the young boys and girls in my brain and brought before me the reality of 2011, images of men and women , now parents and even grandparents. Monica, Darius, Arun, Nirmala, Jimmy, Neville, Rajiv, Gautham, Percy, aban, Sheila, Pratibha, Rekha and Usha. Pratibha also chipped in her part in the endeavours to bring me to Bomaby, even though briefly, by her regular e-mails. Darius was generous enough to propose this trip and along with Jimmy they worked out the visit around the 18th Feb.2011, the Founders€™ Day of the school. Then the visit was fixed between 17th and 20th Feb. Then things moved fast. Darius booked our air tickets to and fro for both me and Subhashini. Then Usha requested me to keep 19th evening free for a tete-a-tete dinner at Wellindon Club with students of 64 batch That was a beautiful experience. There were ten of them including Anita (Gajjar) Shah and Jerusha (Reben) whose looks have not changed at all. I told her ,€Jerusha, I remember your dimples well.€ She was all smiles at my memory. I thank those who organized the dinned at such a posh and exclusive club. And paid for it!!! I was very happy to meet so many of my ex-students who remember me with gratitude and admiration. Among the old staff members I could meet Meeta Moses, Janaki Mani, Mrs. Rao and Mrs. Hajeebhoy. Pardon me if I do not give the names of all students who met me I must make special mention of Naresh Nanda who introduced him as my ex-student who took tuitions from me at B-2 Bhatia Building, near the school. Mrs.Norman immediately recalled his name and said €œ was he not the student who used to come to our place for tutions?€ Her memory is better than mine, I must confess. 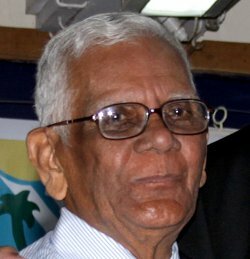 I am extremely glad that he had been first engineer in Merchant Navy, now a professor in a Marine Engineering College in Bombay. He is also the author of a dozen Marine engineering books which are extensively used by navel cadets. That was some achievement. I found him the same old Naresh, humble, bubbling with joy and enthusiasm in seeing me in Bombay. He gifted me with two of his volumes and a picture frame with a legend hand written by himself which will remain with me as a cherished memorabilia. My hearty thanks to Darius and all who offered us a comfortable stay in NSCI Hotel and to Darius for the exclusive use of his car with his driver Sharma ( a pleasant person from U.P. who took us everywhere with a smile) on all the four days of our stay in Bombay. Let me also thanK Darius and Jimmy for meeting us at the airport on our arrival in Bombay . My thanks to Achala Veliker who was very kind to meet us at the airport on our departure for Bangalore. She saw us off, getting into the security area, with a wave of her hand. Thank you Achala: you found a few minutes to meet us and see us disappear into the milling crowd in the airport waiting to fly. And so I am back in Bangalore.